These books would be an ideal promotional gift, for special events, advertising campaigns or incentive packages. They can be ordered in short or long runs, and it is possible to insert specially dedicated title pages (first inside pages) with whatever message, logo and/or picture is desired. If this idea appeals to you, or any of your friends or clients, then please contact us for a quotation for orders of 10 copies or more (of any single guide) which we will be delighted to provide for you. If you'd prefer to send a cheque you can use our order form which can be completed online and then printed out or alternatively printed out and completed by hand. The choice is yours. 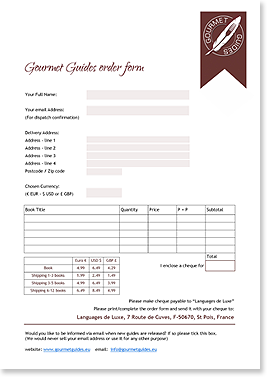 If you wish to order by any other means then email: info@gourmetguides.eu to discuss the possibilities. We are constantly seeking to improve our processes, but to do so we need your feedback. If you have encountered a problem, or have a comment or suggestion to make, then please click on <feedback> to email us or you can leave your comment here. Thank you. You can order your Gourmet Guide books easily online using your Paypal account or any major debit or credit card simply by clicking on the 'add to cart' button next to the guide that you would like. We wish you enjoyable reading. We ship to all countries in the world (except those involved in civil or other wars or unrest). If you have any doubt concerning a particular country then please contact us for clarification.